Posted on 02/12/2008. Last edited on 08/08/2016. Has anyone ever used a vision board? Have you had any success with them? How do you use them? How often do you use them and are they worthwhile? Posted on 03/12/2008. Last edited on 04/09/2012. I use the following (favorite) site to make bold signs on my bulletin board. I also use the cards (that you can make on this site) to learn new info—or simple reminders. the article by him was deleted so I posted the above..
Posted on 03/12/2008. Last edited on 04/12/2008. The page you were looking for was not found on this server. You could have typed in the address incorrectly, or the page may no longer exist. I’m very interested in what you are referring to. I am living in many dimensions at once; the appearance of being trapped in time and space is only an illusion. That’s a good point Mel. Everything around us that we see on a regular basis acts in some way or another as a vision board & we don’t always consciously realise it! Gets back to a few other posts on this forum about being careful who we associate with too! Personally, I like the vision board concept & agree with lin, that if you spend enough time in front of your computer (as most of us do these days), the your desktop wallpaper makes a great vision board. Posted on 04/12/2008. Last edited on 12/01/2010. I believe you were referring to the link I shared. I cut and pasted it again. It should come up. Posted on 04/12/2008. Last edited on 05/12/2008. Posted on 12/02/2009. Last edited on 23/07/2009. It’s great for a vision board or just for making affirmations handy to carry around. Thanks for posting the above link. It is going to be very helpful. Man! I don’t have hardly any magazines! Better head to the thrift store. Well, I still haven’t made my vision board. I haven’t even picked up any magazines yet! I had an Idea I wanted to share though, ‘cause I have been thinking about it. That way I don’t have to search for the right kinds of magazines, I can download very exact images of what I want, and print them inexpensively! I can get tons of pics from google and various sites that suit my particular interests. Just thought I’d share the idea! And what do you guys think about putting special quotes on a board? I don’t have many magazines either, so getting images online is a great idea. Thanks so much for sharing what you put on your vision board and the importance of a gratitude area and what you want to achieve. That probably assists greatly in that tedious balance of loving what you have and still moving forward for what you want to achieve. Oh yeah, places to visit! Now that’s something I can work with! Also I like the idea of a gratitude section. Thanks. Posted on 30/03/2009. Last edited on 31/03/2009. What an awesome idea. 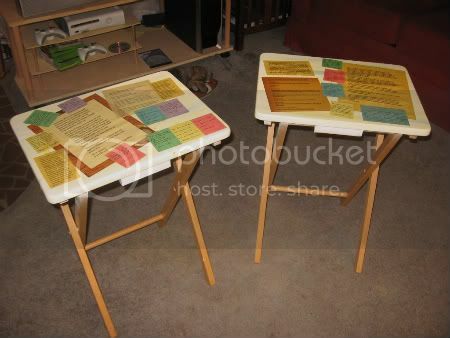 I have my visions in a binder, but I have several sheets of that foam board stuff laying around from a school project. I found some awesome stuff on the internet that I could put on it also. I could put a nice border around the board and turn it a little artsy so I could hang it in my office where I spend most of my hours. Well, I’ve had my vision board up for about a week now, but I still have hardly anything on it; just a couple of quotes so far. I have a very difficult time deciding on the images I want to use, being a little picky I guess. Anyway, I finally came up with something else to add and I thought I’d share this idea with you. I printed out a sheet of paper and all I did was type these few words in great big letters. I tried to work out an affirmation, but haven’t yet. All I did was underline Always and listed options and methods under it, because we always have those things available to us to help us along. Like you, my visuals are lots of places. I have foam boards, binders,eraseable boards, refrigerator magnet areas, etc. I even arrange and reaarange my books in different ways to present my latest focus. That’s is a fun thing to do. Another fun thing is a trifold board I use with non permament tape. I make little flashcard type tasks, goals, ideas and then out of a box of cut-outs (from days when I have time to play->from magazines)I dress up my boards, and regularly move things around to my needs, moods and desires. The one in my kitchen stays pretty constant->health ideas. I’ll tell you about that sometime. We also keep bulletin boards up in various places. I love them. We keep one up on the back of the bathroom door too. You can be 1/2 asleep, and the things you want to bathe in your mind just seep into into your subconsious. It’s a collage of things that point to ideas like balance, breathing deeply, and things that I call the next right thing. I recently tidied up my board. It had become such a blended collage that it led to confusion. Though I do include text, I prefer pictures because I can glance at the board, see an image and quickly feel the emotional connection/vibration to the item or place I want in my world and which I think makes it more powerful. While this helps me focus at least on the more material things, I like written and spoken affirmations for personal development items. This process is very fluid and enriching to me. Thanks bmindful. I had a brilliant flash of genius! I went to look for a digital photo frame that I could use in my bedroom, but they are all still to expensive for my tastes, BUT, I remembered that I already have an old laptop that I never use and it has a bigger screen, I think I’ll set that up in my bedroom and use it like a digital photoframe for positive images and quotes and such. Here’s an idea for you guys if you have an old laptop you don’t use anymore. I opened up WORD and made a bunch of affirmation and motivational notes for myself. I formatted the backgrounds to have different colors, but you could add a background pic or anything else you wanted. I used a big font so it would be easy to read from a distance. I set the page up for landscape view. When I had the page looking like I wanted I hit the “print screen” key. Then I opened up “paint” a program that you probably alread have in accessories on your computer. Once you open paint you simply use the paste command and whatever you had on your screen when you hit the print screen button will be pasted into paint. From there, just draw a box around your affirmation/picture and cut it out. (you do this because the print screen command is going to copy your entire screen, not just your affirmation/picture, you’ll see what I mean when you do it) Once that is done create a new file in paint, paste what you just cut out into the new file and save it as a jpg or whatever file format you want to use. When you have created a bunch of affirmation/pics you want to use you can go to the control panel for the laptop and use the display command to set the screen saver to play a slide-show of your affirmations. I made one and put it on my dresser. You can set it to run for as long as you want. This idea could easily be adapted for those digital image picture frames. It could be used for all kinds of image board stuff. I just wanted to share an idea about how and old out of date laptop could be used for more than a dust collector. Here’s an idea I just had that seems related to vision boards. I have some of those wooden t.v. trays and they have gotten kinda of worn and scuffed so I thought I might refinish them. I’ll have to look into how to do it, but I’ll bet I can print out cool quotes and pics and place them on the tops and then urethane them. I think it’s a cool idea. Besides quotes and pics it would be a great place for recipes and nutrition tips and exercise motivation stuff. that sounds cool. It would be a good business idea: make your own vision board, we finish it into your tray. Am sure loads of singles will go for it. Posted on 22/07/2009. Last edited on 23/07/2009. Here are a couple of pics of the t.v. trays I did. They turned out pretty good. You can’t read the quotes in the pictures, but you get the idea. If some of you make some please share the pics. I painted the tops, then glued the quotes down, then used polyurethane over that. Posted on 09/02/2010. Last edited on 16/01/2012. Lots of wonderful ideas that everyone has posted. Allot of my photos came for the internet and magazines. Put yourself in the right frame of mind and enjoy creating your vision board. Get relaxed,play music you enjoy and make this your time only. I had a vision board made of different pictures and words pasted to pink card. Now I’ve changed a bit, and I use a scrapbook app on my android phone to make vision boards with photos and words. I can at odd moments, just open the app and flip through the pages and look at them to keep me focused. Plus I found this handy, because I can carry it with me — even if I’m on holiday. I put an electronic one on my iPod as well. I also made a scrapbook for positive affirmations. 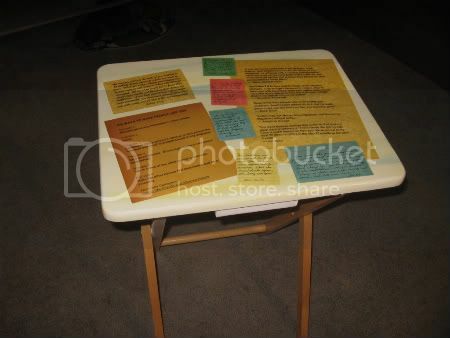 However, I do have a board made with different prosperity affirmations and photos taped to my bedside table so that I can see it wen I go to sleep and when I wake up. P.S. I like the idea of a gratitude section! In response to SelfcareLivingLifeOfEase's post:I forgot I once did this vision-boards on a trifold board.